These days, people crave to have characteristics that are unique and different from others. This tendency can be discovered even when looking at the food people eat. To meet the changed tastes of their customers, food creators have for awhile, been developing fusion food culture. This fusion means not only the merging of cuisines belonging to different ethnic cultures, but also traditional Korean food remade in a modern fashion. Looking at the fact that the breaking-down of boundaries occurs between ethnic cuisines as well as traditional and modern, we can understand that fusion has no fixed form. There are interesting points that can be discovered when looking into this change of food form. Korean food combined with foreign features such as sundae steak, rice-cake tart, or cheese bingsu are continuously being developed. This takes place in terms of alcoholic beverages as well, which many people are interested in. Makgeolli cocktail bars, which serve Korea’s traditional alcoholic drink makgeolli mixed with different ingredients, are opening up and are often full of customers. 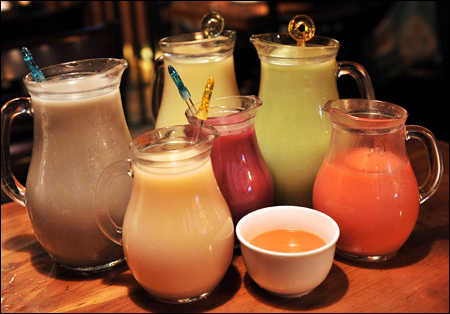 There are various kinds of fusion makgeolli, starting with ones mixed with fruit to ones mixed with Western foods such as ‘whipped cream yogurt makgeolli.’ The fusion snacks served with these drinks such as ‘Hawaiian cheese potato pancakes’ and ‘sweet potato pizza kimchi pancakes,’ are also loved by customers. Like so, because fusion food results from the process of harmonizing or modifying different kinds of foods, the creation of new kinds of food is endless. People have come to recognize fusion food so much that along with fusion food restaurants opening all of the time, a fusion food department store has opened. There is also another style of restaurant in the form of franchise chain stores, which focuses on fusion food. ‘School Food’ is an example of this. This franchise restaurant cooks Korean favorites such as gimbap or tteokbokki in different ways or with ingredients usually used in Western cuisine. ‘Cheese tteok-bokki’ or ‘carbonara tteok-bokki’ clearly shows this fusion characteristic. In this restaurant’s case, fusion also brought a change to the image of such foods from cheap to luxurious. Despite such price and image changes, perhaps due to the familiar characteristics that still exist, people have encountered theses unique foods without much resistance. As such, there is also as much variety in the form of restaurants with fusion food as there is a theme. Also, popularity has been great enough to lead many people into participating in this new way to start a business, and putting effort into researching foods to match the changing taste buds of customers. When talking about fusion food culture, there is more than just the combination of different cultures. A new food can be created when traditional and modern features meet as well. As an example, the ‘Osulloc Tea House’ can be suggested. ‘Osulloc’ is an acknowledged tea brand that has been steadily producing green tea related products for several years. ‘Osulloc Tea House’ is a green tea café that was founded by this brand. The traditional ingredient of green tea is used not only in drinks but also in foods as well. The creation of delicacies in this case, shows the modernizing of Korea’s tea culture. There are various fusion dishes available such as ‘green tea roll cake’ where traditional and modern styles coexist, which is appropriate to satisfy the people of today, who emphasize the importance of well-being. ‘Sulbing,’ a bingsu café, is another successful case of this type of fusion characteristic. This café creates desserts using traditional ingredients such as rice-cake or red beans that suit modern tastes that have changed as time goes by. It drew the attention of customer demands related to it being a healthy food as well. The rediscovery of traditional food has also been going on in ordinary day-to-day menus. The popularity of modernized traditional food can be proved by looking at jokbal specialty restaurants that have researched simple cooking strategies and new sauces. These have led to the end of the belief that jokbal is a traditional food that takes a long time to prepare and does not meet to the taste standards of young people today. An example is the successful restaurant ‘Jokbal Jungsim’ which is located in Hongdae, a location where young people mostly roam. The hot sauce that steals the taste buds of those in their 20s and 30s, a sophisticated interior design, and witty advertising about the good properties of jokbal were the reasons for its fame. It shows that modernization fusion brings change to the “old” and “long preparation time” image in peoples’ minds about traditional food. 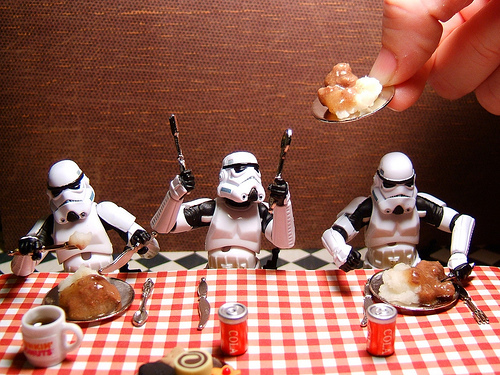 Traditional food is no longer outside the area of the attention of the young. Actually, it has now become another meal option to look for. Other interesting ideas for launches of modernized foods besides jokbal, are for example dakbal or sundae, which has drawn the interest of many people due to its potential for success in such related businesses. The growing influences that fusion food culture has are looked at from various perspectives. There is a positive side that in a current era where searching for the “new” has spread like a trend, such variety and uniqueness is appropriate. Such variety has opened up new job possibilities, like the chain restaurants, and growth potential in the further development of food. In terms of globalization, fusion foods could be appealing to foreigners who find it difficult to become close to Korean cuisine. The foreign properties added to the original dishes make it easier to approach the food. There are questions raised on whether a change in the way people think about original Korean food will occur in a negative matter. That is, the emergence of fusion food could make people crave for food with foreign properties contained in them, rather than their culture’s own cuisines, hindering the identity of cultural food heritage. Not only so, publicizing Korean food modified to fit the tastes of foreigners could make it difficult to preserve ‘food culture,’ which is one of the key points of a country’s own culture. Advocates of this point say that food globalization should take place by making the original characteristics of the food stand out, rather than through modification. Fusion food culture is a result of experimentation. Such an attempt for change was the right response for a society where change is needed for survival. However, the changes should be made without damaging core ethnic characteristics. If little of such originality remains, it would be needed to be categorized under a new style of food rather than fusion. If progress is brought by keeping caution to these points, the positive potential in food advancement is infinite. How about choosing fusion for today’s meal?